Lemonade is a drink with endless possibilities. After the great success of my strawberry lemonade, I’ve been daydreaming about different medleys like blueberries, or cherries, or even pineapple. Unfortunately I don’t have any of those growing in my own backyard but I do have plenty of herbs, and lavender seemed the perfect choice to start with. Searching the food blog world turned up all sorts of ideas on how to make lavender lemonade. Most recipes used the flowers of the lavender which seem to create a beautiful fuschia color (My Own Sweet Thyme has a beautiful example). Several of my lavender buds got eaten by bugs before I started spraying (organic sprays don’t worry! 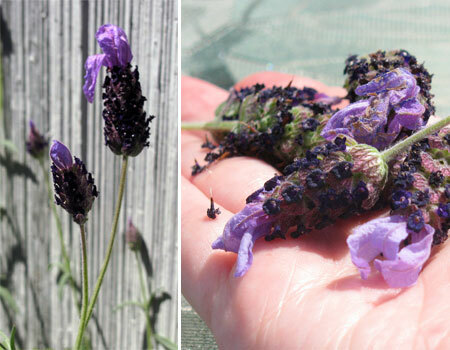 ), so I just used a few buds along with several sprigs of lavender to increase the flavor. One fun tip if you’re serving this to guests like I did, add a few drops of green food coloring to your lavender sugar syrup. It’s not necessary but adds a fun bit of color that makes your guests say “oooooh!” before they even taste it. 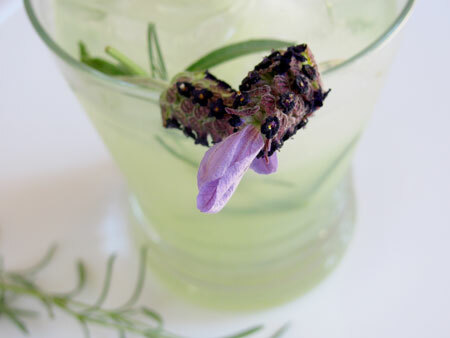 The lavender itself is a nice surprise in the lemonade. Typically citrus juices are mixed with other fruits, but the freshness of lavender gives a bright and unexpected finish to each sip of this cheerful lemonade. Everyone who’s tried it has said it’s amazing, but don’t just take their word for it, go make some yourself! Mix 3 cups of water with the sugar in a pot and bring to a boil on the stove. Stir to make sure the sugar is melted and add the lavender. Remove from the heat and let steep for at least 10 mintues (the longer you steep the stronger the lavender flavor). Pour lemon juice and remaining 1 cup water into a large jug or pitcher. Strain lavender sugar syrup and pour into the pitcher. Add ice and mix well. Approximate cost/serving: The lavender is free from my garden and lemons are really cheap right now. The whole pitcher of lemonade cost me under $1 and factored out to just 7 cents a glass! Vegetarian/Gluten Free: No substitutions necessary. Gorgeous. I wish I had some lavender on hand as this sounds like the perfect twist. I bet the floral flavor is so nice. I must say I’m intrigued. I haven’t been stoked about the taste of lavender in the past, but I might have to give this a try. Sounds so refreshing! 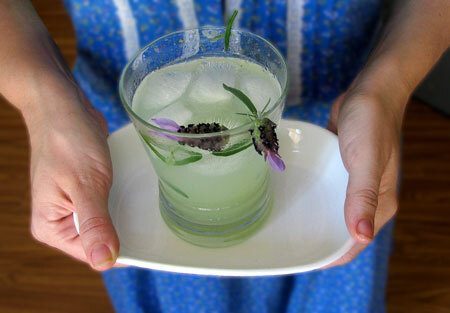 Now I want to head out to the herb garden and look around… rosemary lemonade especially sounds terrific to me. 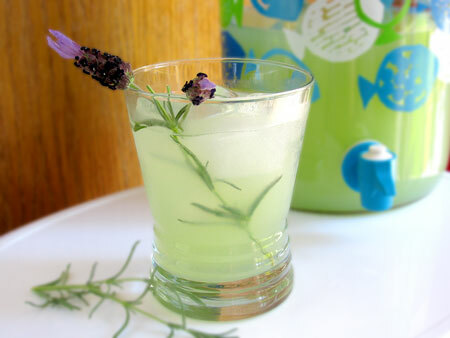 I make basil lemonade when my herb garden is overflowing with it, and I recently had some amazing rosemary lemonade at a restaurant. Lavender is a new one for me but sounds delicious! I have found they are even better when you use sparkling water. Oooh I’ll have to try it with sparkling water. Of course that increases the cost but it would still be cheaper than an alcoholic beverage. Sounds delish! You mentioned that you thought the idea of pineapple lemonade sounded amazing. Well because I have been making it for a little while now, I can tell you that without a doubt it is the most amazing lemonade you’ll ever have!!! although I have had lavender lemonade and it is great too. I just thought I’d comment on your ‘dreams’ for lemonade.